General Number LLC opened pre-registration for businesses and non-profit organizations to adopt General Number (GN) as a gateway that makes it unnecessary for the vast majority of businesses to create their own mobile app. "Originally the company tackled a single problem familiar to everyone: frustration while sharing a name, email or street address with another person or customer support representative," says Scott Hunter, GN's spokesman. "During the beta, however, users found new ways to use GN's mobile platform, which eventually evolved into the Universal Business-User Interface (UBUI). It enables any organization to provide users with the experience of a custom mobile app without asking users to install one. This also solves the problem of too many business apps competing for limited space on a smartphone home screen." Early GN adopters include the PCOS Foundation (GN “PCOS” or “2933”), Don McGill Toyota (GN "Autos" or "2000"), attorney Joel Gordon (GN "Attorney" or "77") and many other organizations and businesses. Lisa Benjamini, President of the PCOS Foundation and well known Houston philanthropist, shares her GN experience: "Rather than waiting for at least a month and investing almost $3,000 in the development of our own mobile app, it took my administrative assistant only five minutes to create the GN. It does everything we would want to have in our mobile app and has some functionality that is only available through GN. For example, our patrons can now make a donation pledge in under 10 seconds." 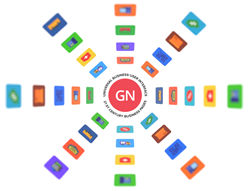 An organization's GN is a number and a word (vanity GN) that can be transferred into a smartphone almost instantly from any medium and appears like a phone contact, which takes no additional space. From here, the user has access to the UBUI containing the organization's interactive contact information, including optional links to social media, promotions as well as a whole range of mobile app functions. Some of these functions include GN's exclusive cross-platform customer support, pledging to non-profits, submitting information into a doctor's electronic medical records, and sharing location with road side assistance. Unlike a social network, GN is private by design. It requires neither registration for customers, nor does it store their information in the cloud. Businesses and non-profit organizations are invited to sign up to receive an invitation for private registration 72 hours before it is opened to the general public. General Number LLC is headquartered in Houston, TX. GN’s core team members have worked together since 1999 for Internet Security Alliance, which developed pcInternet Patrol, now owned by Symantec Corporation. The patent at the center of pcInternet Patrol technology has been cited as a prior art in patents filed by Microsoft, Fujitsu, McAfee, Kaspersky, IBM, and many other major corporations. US and International patents pending for UBUI.